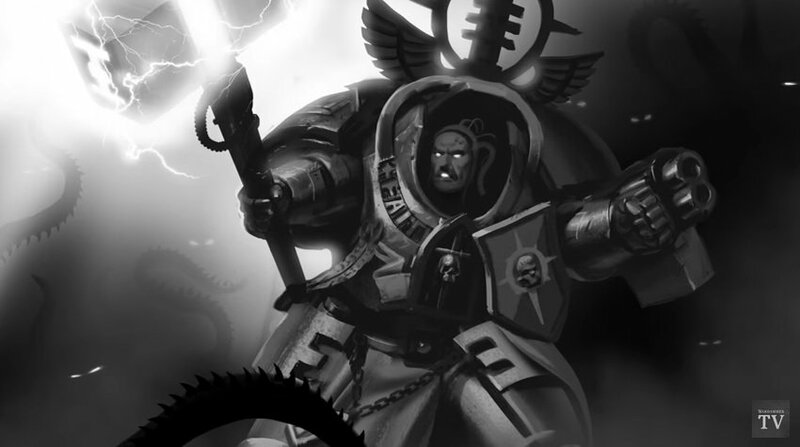 The Grey Knights are back and they have some pretty mean Psychic Shenanigans – let’s rank’em! We’re looking at these from a strict Matched Play mindset. That means you’re limited to casting each power only ONCE per turn. No multi-casting Gate of Infinity on every unit the whole game (because holy crap – it’s great if you can). We are looking at a couple of combos with the powers. These were used as Tie breakers. Other than that, we’re just talking about them with regards to the Sanctic (Grey Knight specific) powers. We’re also not counting Smite/Rites of Banishment – let’s be real, that’s probably the one you going to be casting the most just because you will run out of powers as a Grey Knight force…There just isn’t enough of them to go around! Okay – Let’s dive in! Purge Soul is low on our list because it’s basically just Mind War. Most of the Grey Knights units have a value ranging between 7-9. Even Draigo and other Grand Masters only have a 9. It’s not terrible – it’s just not super impressive compared to the other powers in this list. If you factor in that you really only need a 4+ to cast it, then it doesn’t seem too bad. But again, there are better powers to use. To me, it’s like a Smite with more points of failure. Unless you’re facing folks with a really low leadership it’s just not that impressive. This is where we get into debate territory. 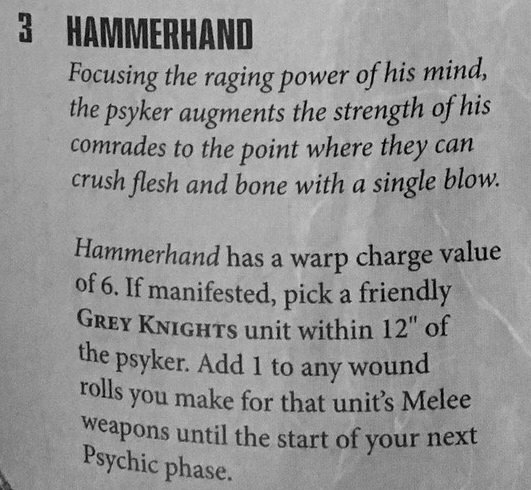 Hammerhand is an iconic Grey Knight power and it’s good! It’s down right amazing when you use it correctly – adding 1 to any wound rolls for Melee weapons is fantastic in certain situations. Toss this on a Strike Squad before they charge into combat at watch the enemy crumple. So why is it #5 and not higher? Because the Grey Knights are an effective Mid-to-Short range mobile fire base army. While they are good in close combat, you shouldn’t be using this ability unless you’re mopping up a unit. If you get your boys in Grey in a protracted Close Combat, you’re probably not using they shooting as effectively as you should have. Use Hammerhand to move in and mop-up. Use it to drop tough targets like vehicles or Dreadnoughts-types. Don’t cast it on a unit and expect it to wipe a 30 strong unit of Ork Boyz solo. It’s good, but it’s not that good. Vortex of Doom is pretty dangerous for it’s target(s). It’s doing Mortal Wounds and it has the potential to really mess with a lot of units if used correctly. Tossing this on a unit that’s close to a few other enemy targets is down-right mean (and also entertaining)…So why is it #4 and not higher? Well, the Warp Charge value for one. 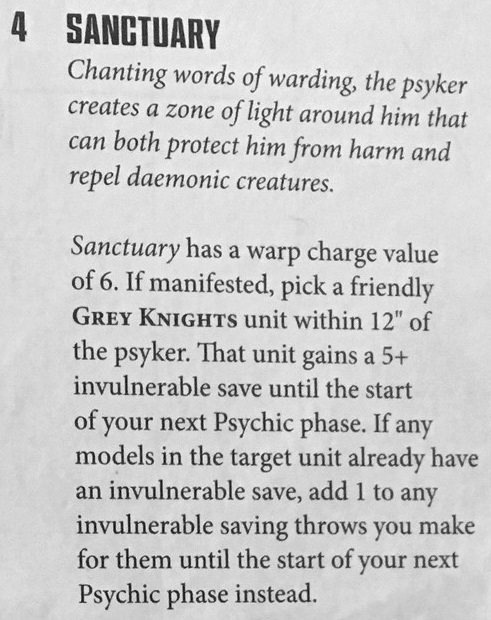 Most of the time you’ll need at least a 7 to cast thanks to Brotherhood of Psykers. That’s average, so it’s not impossible or anything (plus re-rolls). The big issue is that it only targets the nearest visible enemy model. Their unit and any unit within 3″ suffers damage. That’s the problem: this power must be used with correct positioning. It’s not as “fire and forget” as some folks are making it out to be. On the flip side, if you DO position correctly it can be used with devastating effect. However, the Grey Knights have a boat-load of really good powers so that’s why Vortex is solidly a #4 in our book. This is where we really get to the cream of the crop. Astral Aim is easy to cast (most of the time you only need a +4) and it’s extremely deadly. 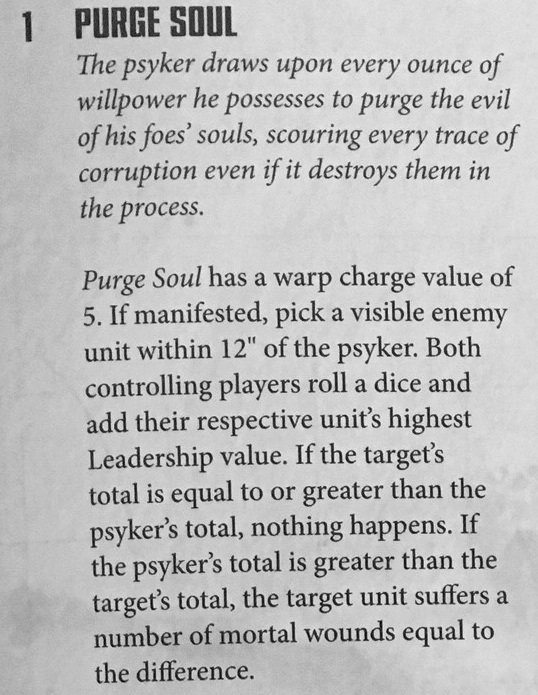 Using this on a unit with Psycannons or even a “basic” Strike Squad can turn their firepower up to 11. I said we were talking about combos as tie breakers and this was one case where we had to use them. 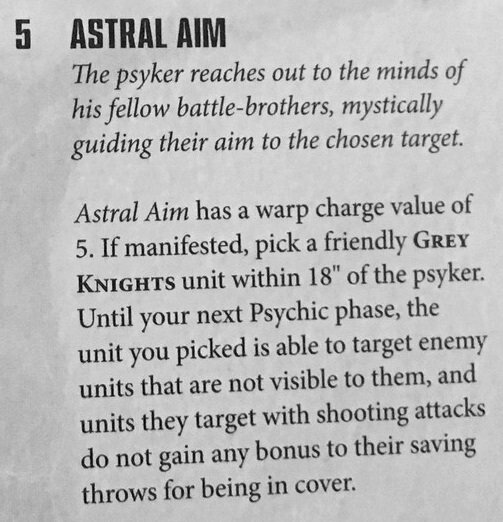 Astral Aim + Psybolt Ammunition (a Stratagem) means that all your Stormbolter shots are now Str 5, AP -1, and the target unit doesn’t get cover. Oh and they don’t have to be in Line of Sight. A unit of scouts hiding in a building? Not any more. A unit of Chaos Space Marines in cover? HAH – dusted. Astral Aim breaks one of the core rules by ignoring Line of Sight. There is no “safe” spot when you’re facing a Grey Knight army with access to this power. That’s why it’s #3 on our list. This is an ability that doesn’t seem like much by itself – but remember we are including combos now. Quick, off the top of your head, do you know the Invulnerable save of a Grey Knight Grand Master? Here’s a hint: Iron Halo! When you cast this on him, he now has a ++3 invulnerable save. Pretty good right? Well what if you spend 2 more CP so you can use Heed the Prognosticars? That means his save is now a ++2. Well now, that going to be pretty rough to deal with, but that means you have to spend 2 CP every turn – that’s pretty costly! Any way you slice it a Grand Master with a ++2 and 6 wounds is going to be extremely tough to deal with. If you’re worried about his lack of damage output, you can always have another unit toss him Hammerhand, I did say it was good, didn’t I? Location, Location, Location! 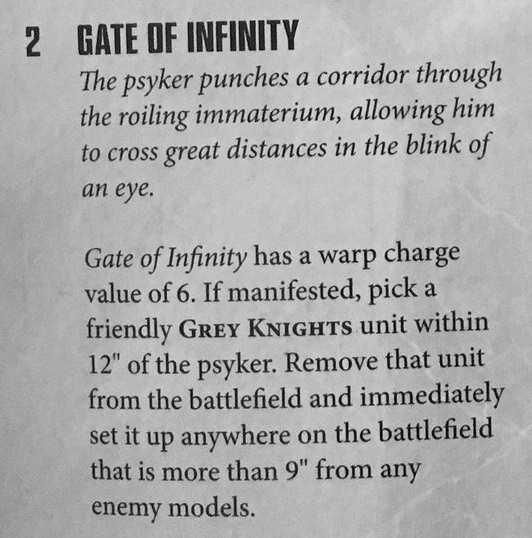 Gate of Infinity is now my favorite Grey Knight power. With all the changes in 8th to shooting and charging, being able to move a unit out of the “Danger Zone” and into a more advantageous firing position is amazing. It’s going to go off fairly reliably as most of the time you only need a +5 to cast it. My favorite tactic has been to use it to teleport behind the enemy, roughly 12″ away so my unit is still in Rapid fire range. Unload on them and now they have a choice – turn around and go after the unit that is behind them and ignore the rest of my forces, or plow forward and get shot from the back more. Using this to bait the enemy into moving to less advantageous positions is the real power of this ability. Present a juicy target – if the enemy falls for it and moves towards it, Gate away and live to fight another day. 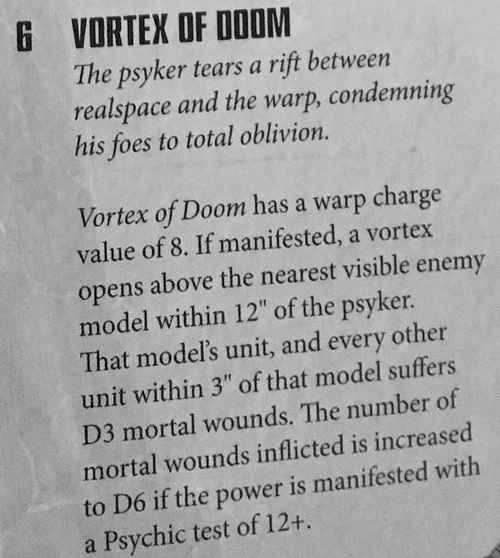 If they don’t – well, rain holy bolter/psycannon/prometheum on them. You can also use it to setup a charge – I don’t recommend it as you’re over 9″ away…but if you’re desperate, you might as well go for it! The utility of this power and the ability to correct a poor placement is invaluable. Using this power at the right time is like watching a surgeon go to work. That’s why it’s our #1 pick. That’s our ranking for the Grey Knight powers – do you agree or disagree with our list? Let us know in the comments below!